Tattoo shops are spread all around town in the Los Angeles of today. Back in the day however, shops were located mostly on North or South Main Street. A partial list of tattooists working on Main Street includes, L.W. Duff, James Fraser, J.B. King, Lou Lewis, Bert Grimm, Owen Jensen, "Red" Gibbons, Harry Lawson and Charlie Barrs. 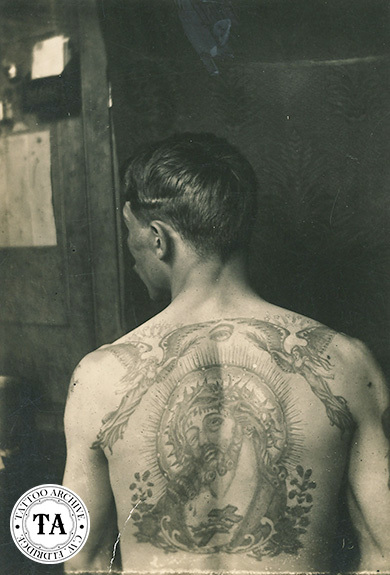 Although his fellow tattooists held Barrs in high regard, few photographs of him or artifacts of his flash remain today.Several stories have circulated about his childhood. One story says that he was born in Maine where his father was said to have had a fleet of fishing boats. Another story states that he was born in Holland and jumped ship in the United States. The date of Barrs' birth is not known although Paul Rogers said Barrs was 72 when he met him in Norfolk, Virginia. Since Paul was located in Norfolk from 1945 to 1950, Barrs must have been born in the 1870s. It is unclear when and where Barrs started tattooing, but early on he got a Christ Head back piece by Buckie in Philadelphia. Buckie was considered by many to be one of the best tattooists of his era and it is possible that Barrs may have got some training from Buckie. During the early part of the 20th century, many great tattooists worked circus and carnival sideshows early in their careers. Some worked as attractions, others as attractions/tattooists. Bert Grimm tells a story about running into Cap Coleman who was working a carnival in Cincinnati, Ohio in the early 1900s. Within a few years Coleman had left the road and set up shop in Norfolk, Virginia. Grimm stated that Coleman got in touch with Charlie Barrs and invited him to work with him in Norfolk. Apparently Coleman made Barrs an offer he couldn't refuse; 100% of his take and free room and board. Coleman had heard of Barrs' talent and wanted to learn from him. Barrs made the trip east to work with Coleman. Bert Grimm went on to say that when Barrs left Norfolk, Coleman's tattooing looked like Charlie Barrs, only a bit heavier. 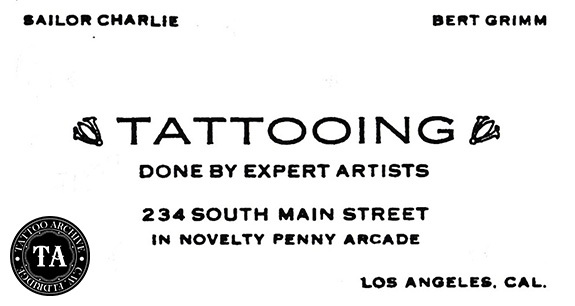 By the 1920s Barrs was working in Los Angeles in the Novelty Penny Arcade located at #234 South Main Street. This is the same location where Bert Grimm worked with Barrs in 1924 and 1925. After Grimm left Portland for Los Angeles, he worked with Jack Julian at #412 South Main. About his time with Charlie Barrs in Los Angeles, Grimm had this to say, "In 1924 I was working with Charlie Barrs in Los Angeles. The Pacific and Atlantic Fleet met for maneuvers in San Pedro. I worked 24 hours straight, on nothing but Sailors. I made $206 and Charlie made $202". In 1926 Grimm left Los Angeles for Chicago. Years later Bert Grimm wrote on the back of a photograph of Barrs back piece, "I prize this picture a lot. Not because I like the back piece but because it is Charlie. He is the granddaddy of all good tattooing". Charlie Barrs then invited Owen Jensen into his shop. Jensen jumped at the chance. 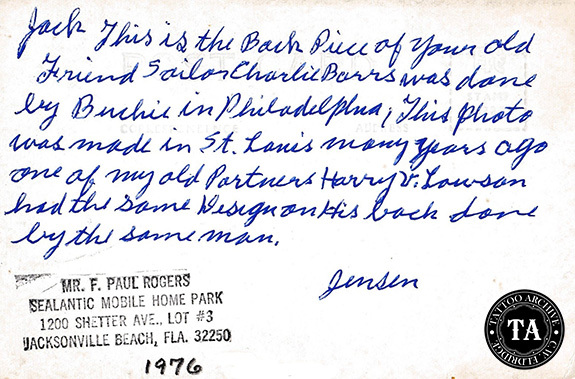 In a 1972 letter, Jensen wrote, "He had been in this arcade for several years tattooing. He was a very quiet guy, but at this time he really was rated as just about the best tattooer in this country, so of course I was very pleased to get a chance to tattoo with someone that good. When I went in with Charlie I sold my spot in San Pedro to a young fellow named Sandy Dillon, he had been covered by Charlie and Bert Grimm". Barrs made several other trips from the west to the east coast. Because of his friendship with many east coast tattooists, he would often travel and work in their shops. Paul Rogers told this story about the time that the west coast fleet had come for maneuvers on the east coast. Barrs drove across the United States to help Coleman tattoo all those sailors. At that time west coast artists were getting better prices for their work than those on the east coast. So when Barrs arrived back east he had Coleman take down all the sheets of flash with the 25¢ and 50¢ designs. Barrs did not want to work that cheap! Shortly before the closing of the Norfolk, Virginia tattoo shops in 1950, Barrs left San Diego where Bob Shaw said he had been working with Painless Nell. Barrs headed back to the east coast, this time to work with William "Bill" Grimshaw. Just two doors down from Grimshaw’s shop was Coleman’s Place on East Main Street. Barrs was now in his 70s, and semi-retired. It was at this time that Paul Rogers met Barrs and was exposed to his years of experience. Paul recalled a good relationship with Barrs and proudly credited his style of machine assembly and tuning to him. Paul said, "He was the tattooer back in the old days on the west coast". Charlie Barrs death date is unknown, however Paul Rogers received cards and letters from him and his wife Lillie up until 1960.